The only thing better than sitting out on the patio under the pergola has to be enjoying the night air with cafe bistro lights. 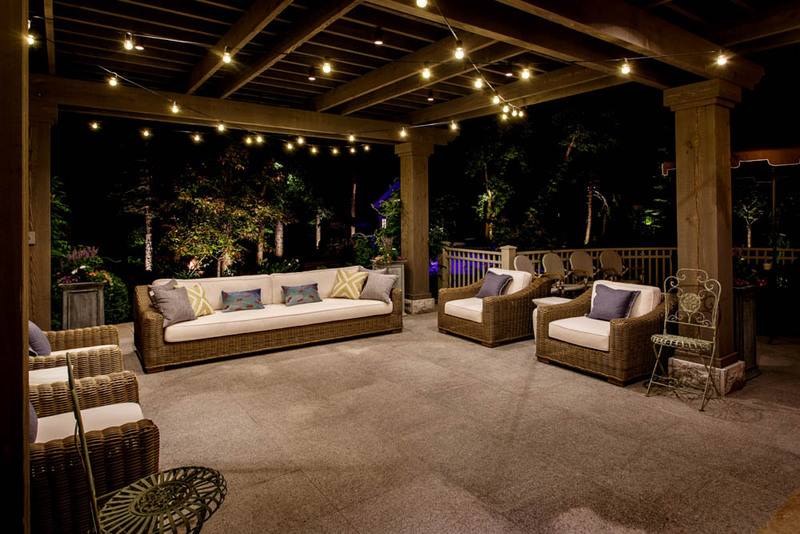 While there are countless ways a pergola could be lit, bistro lights offer something different that really allows you to set the tone for the evening to whatever you like: you can have the night be quiet and romantic, or ostentatious and festive. They go by many names: string lights, café lights, bistro lights, etc., they're all the same. The only thing you need to remember is to not get them mixed up with Christmas lights. Bistro lights can be used to achieve different lighting effects. 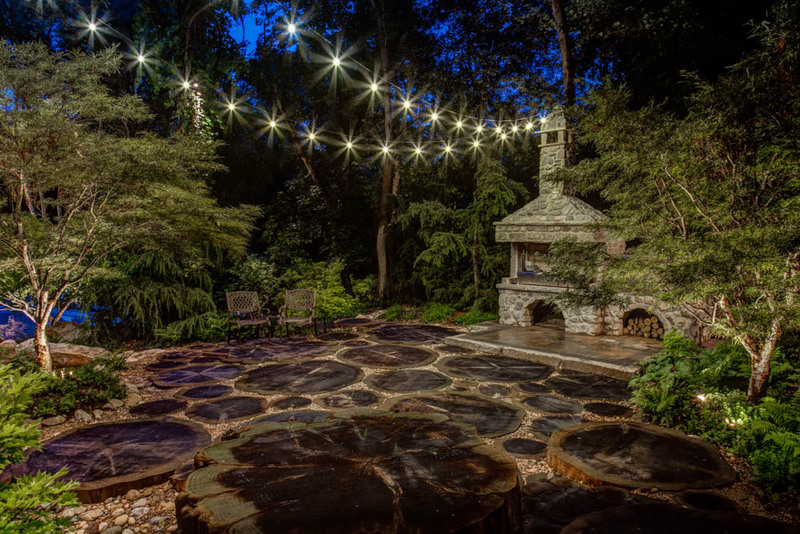 They are used to illuminate seating, and can add some serious charm to a small yard when they are used to decorate a pergola, patio, gazebo, deck, etc. Festive is a word often associated with these lights. Bistro lights have become incredibly popular over the last few years. We install more of them now than we ever have before. And with so many different cord and bulb styles available, we can truly create custom bistro strands cut and measured to fit a pergola perfectly. Keep in mind that Bistro Lighting is meant to be an accent; there is no need to go overkill. String lights are a great example of that saying: less says more. One of the best ways to use bistro lighting is in combination with a remote dimmer switch. With a dimmer switch, you have full control over what kind of mood your bistro lights are going to offer you and your guests. Are the neighbors over for a barbeque? Is family over for an event? You can adjust the dial on you dimmer switch to fit the setting. If lots of people are over, then it's time to turn up the volume on your lights so everyone knows where the party is happening. On the other hand, if you and your significant other are planning to enjoy a nice quiet dinner on the back patio, then turn the volume down on your lights. By dimming the lights down, a romantically magical atmosphere can be found where before non-existed. Moral of the story: If you are having string lights installed, make sure a dimmer switch is going in so you can enjoy the best of both worlds. Why not give your restaurant the perpetual feeling of a European Bistro with beautifully arranged commercial string lights? Be it for a restaurant, reception center, market, etc., string lights set the tone for whatever atmosphere you’d like people to experience. Al fresco dining it is! Revealing key features in the surrounding landscape also adds to the experience. Don’t forget that cafe bistro lights aren’t the only way to add intrigue to a space. If anything, illuminating the surrounding landscape breaths layers of depth and drama into the scene that otherwise would be completely missed. 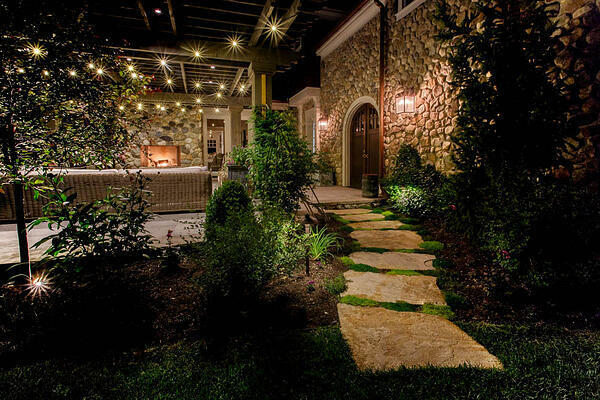 Adding cafe bistro lights and landscape lighting to your outdoor space does more than just provide functional light. These lights bring emotion and beauty to your space too.